I’m not sure Einstein ever actually said this. He did say, though, that the most incomprehensible thing about the universe is that it is comprehensible. Which if you think about it sort of amounts to the same thing. And that brings me to sea turtles. What’s the big deal about sea turtles? I don’t really know. I just feel it, somehow. What I do know is this. Sometime before one hundred and fifty million years ago, a species of turtle went from living on the land (or possibly in fresh water) to living in the open ocean. These turtles became almost perfectly adapted for life in the sea, with two big exceptions. First, they kept breathing air – a pretty dumb thing for a water animal to do, if you think about it. Second, they kept laying eggs on land. Again, a goofy thing to do, especially since turtles and all other land vertebrates evolved from creatures who not only had gills, but also laid eggs right in the water. How much easier their lives might be if they could have recovered these ancient traits? But because sea turtles both breathe air and lay their eggs on land, their lives are the stuff of epic poetry. A long journey, sometimes across half an ocean or more, ends in a dangerous nighttime crawl out of the waves and up a long, sandy beach. There, the giant turtle, much more at home in the buoying water than in the harsh, dry air, digs a nest to harbor over one hundred small white eggs. Tears stream down her face (we know it’s just her salt glands removing salt and sand, but the poets in us always wonder if it could be a little more). Finally, she covers her nest and returns to the sea, the ocean waves washing the sand from her flippers and dome. Weeks later, after an amazing transformation that happens with essentially no help from the outside world, more than a hundred baby turtles boil from the sand and scramble down the beach. Their tiny flippers, searching out the water that will support them all the days of their (hopefully) long lives, are oddly ineffective on the sand, yet somehow, finally, they reach the waves. The water buffets their tiny bodies (what an amazing feeling it must be, that first kiss from the sea!) and finally they, too, are gone. 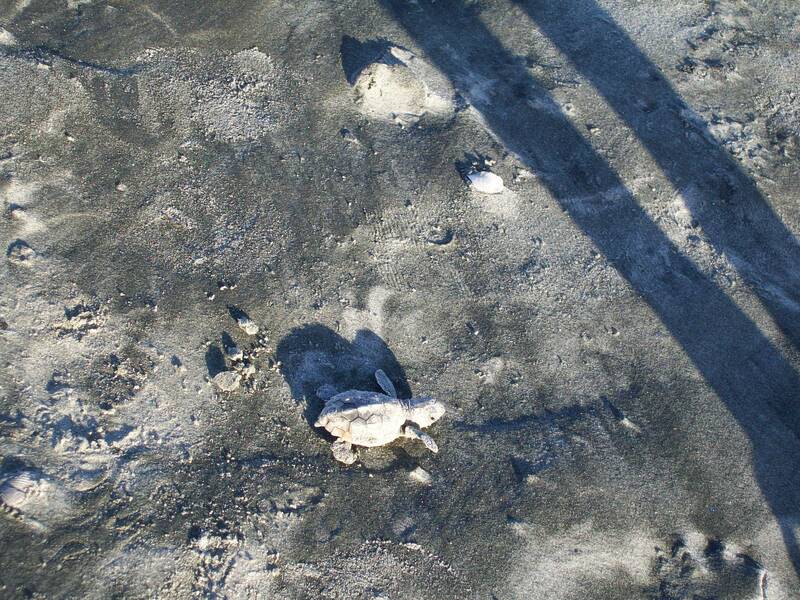 Last summer, for the first time, I saw a mother sea turtle building a nest and laying her eggs. It was a transforming moment for me, something I will never forget. And yet I never thought I’d see the other half of this story, the hatchlings reaching the sea. 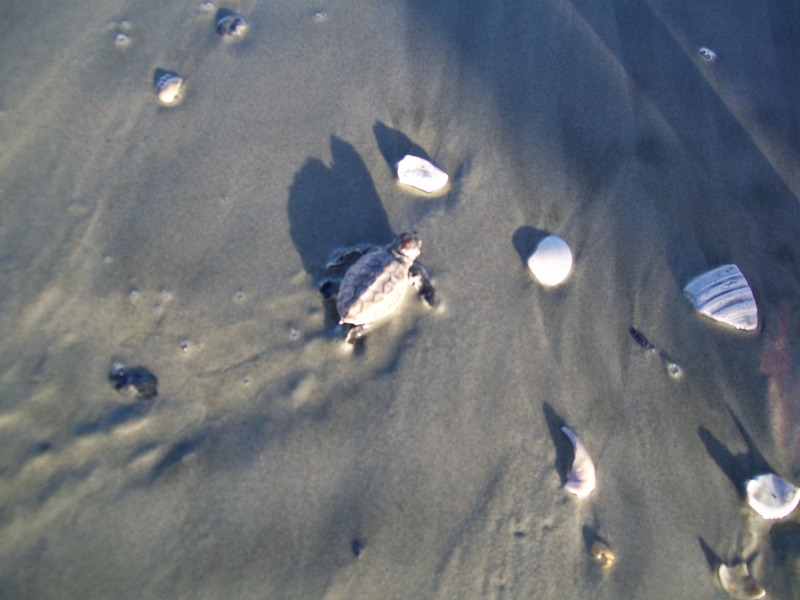 On our first day in Folly Beach, SC this year, I discovered that the Folly turtle patrol would be inventorying a recently-hatched nest. My family and I scrambled to the meeting place to arrive by 7 pm. We expected some torn shells, maybe even an unfortunate hatchling or two that hadn’t survived the hatching. Instead, we witnessed a miracle. Fifteen living babies emerged from the nest, stuck there since the hatching five long days before. 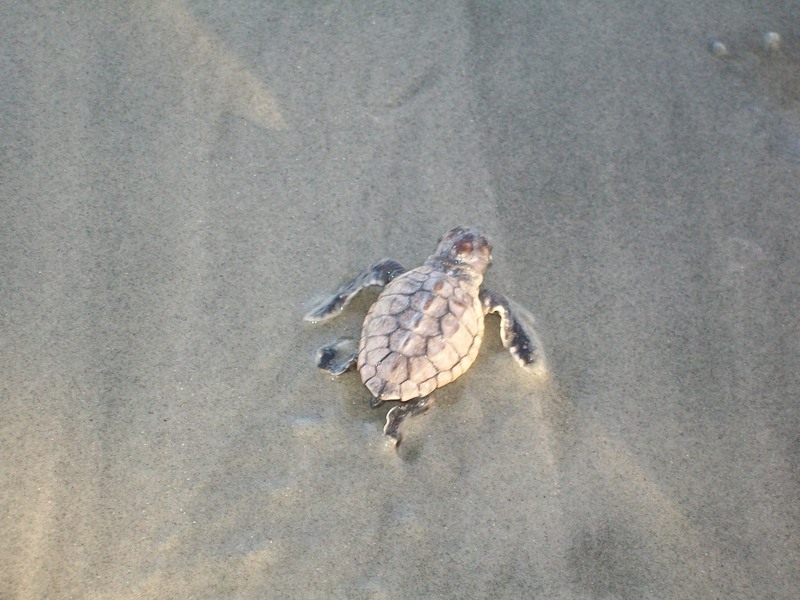 The turtle rescuers moved the exhausted hatchlings to the edge of the surf, and we watched them crawl. They were disoriented and confused, but eventually all fifteen found their way to the water, felt that first kiss from the ocean, and disappeared into the waves. I have no idea if any of the fifteen will return to Folly Beach decades from now to build their own nests. In fact, it’s unlikely that any survived the night. Their odds weren’t good; only one in a thousand hatchlings makes it to adulthood. But in that moment, those fifteen turtles pulled living from the sand and delivered to their home in the sea was miracle enough for me. Thank you to my wonderful wife Julie for taking these pictures while I followed the path of the fifteen tiny miracles down the beach. I don’t think I blinked.